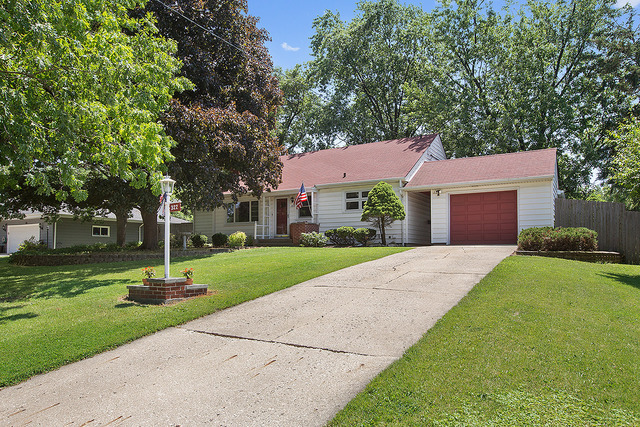 Charming open concept RANCH home is beaming with character! Picturesque double wide lot just under a 1/2 acre with mature trees and paver patios for great outdoor entertaining spaces. Lot is fully fenced for your outdoor enjoyment and privacy. Sprawling, open floor plan with spacious rooms for ease of entertaining. Beautiful kitchen with an abundance of cabinet and counter space. Relax in the large living room highlighted by the beautiful original stone fireplace. Glorious sunroom with new carpet opens to your backyard paradise. 3 spacious bedrooms with hardwood floors. Full partially finished basement with a family room, full bath, laundry room, workshop and great storage space. Full attic with interior access spans 36 feet and can be finished for additional living space. Potential to add stair case in linen closet. Newer windows, new A/C 2017, updated hall bath, new laminate floors in living room. Ideal location near schools, parks, shopping, METRA and expressway access.